Unfortunately, the transcription of this name from English to Hebrew was poorly done. Add to that a bit of freehand styling, and you've got yourself something utterly unrecognizable. Had I not actually known this tattoo was meant to say Xara, I never would have guessed. In fact, it reads something like "Ksaoch". The first mistake is due to the letter X, which is absent from the Hebrew language. Whoever composed this tattoo, used the Hebrew letters Qof and Samekh to represent the X. This combination reads as "KS", but the kid is not named Ksara, is she? When transcribing a name, phonetics are very important. We've seen this kind of phonetics fail already, in a "Michaela" tattoo. See, the name Xara can be pronounced as either Zara or Sara and the Hebrew should be written accordingly. The second mistake in the original tattoo, is the sloppy styling. Do not attempt styling Hebrew letters unless you know Hebrew! Compare these letters to the tattoo, can you see what went wrong? Styling your Hebrew is dangerous. Kids, don't do it! Just as a change of pace, how about sometimes sharing some good Hebrew tattoos? ^where's the fun it that? Just kidding. Seriously: using the koof-samech for a beginning 'X', when we use it only to (try to) transliterate 'X' as a mid- or final letter explains this one. That and the uber-florid script. My problem is in seeing the 'X' as a Russian letter, transforming the name into something resembling mud, only more organic, ha. As far as I know, it is possible to transcribe an X as קס (for example Xenophon = קסנופון). i think this site is mean. so you know hebrow so what. so am i and 6 milion other israelies. if you want to do a hebrow tattow, DOND look at this web site, just find someone nice and check his facebook to see that he is from israel. and check with a few other peaple befor you get tattowed. @libat - Mean, me? I just say it like it is. 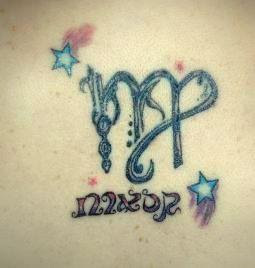 Your advice is sound, but people won't know what to look out for, unless they see just how wrong a Hebrew tattoo can go. אמנם לא יפה להיות רעים, אבל Xara בתעתיק, למי שלא נתקל בשם בעבר, באמת מעלה את המחשבה על "חרא".